This photo shows the Fairfield water tower near the Great Piece Meadows as seen from Caldwell. This photo shows the view of West Essex and Morris Counties from Bloomfield Avenue in Caldwell. South Orange, New Jersey: The annual Hometown Holiday event will return to the South Orange Village Center again this year. The 2015 event will be held on Saturday, December 12th. Attendees can take photos with Santa at the historic South Orange Fire House from 1:30pm to 4:30pm, before the parade up South Orange Avenue for the tree lighting outside of the South Orange Center building at 5:15pm. There will also be musical performances and discounts at local stores. In addition, the South Orange Pop 'n Shop at 65 South Orange Avenue will be open. The event will be sponsored by Provident Bank and the South Orange Village Center Alliance. The South Orange Center building is located at 76 South Orange Avenue, between Irvington Avenue and Valley Street. Click here to learn more. Newark, New Jersey: A new furniture store will open in Downtown Newark. Retro Remixx Home Decor and Furniture will be located at 12 Linden Street, between Washington and Halsey Streets. The store, which will be owned by the Off the Hanger boutique, will also sell clothing. It is scheduled to open to clients in February, 2016. The Newark Street Doctor's organization, Street Warriors, previously operated an office in the space. The organization was evicted in April, 2010, according to Local Talk, and the space had been vacant since. There are currently three other furniture stores in Downtown Newark, though there are around one dozen across the city. Click here to learn more. Newark, New Jersey: A location of a national fast casual Mexican restaurant franchise will open in Downtown Newark in the near future. Qdoba Mexican Eats will be located within Prudential's new Shoppes on Broad development at 64 Halsey Street, at the corner of New Street. It will join Starbucks Coffee and another fast casual restaurant, Blaze Pizza, in the development, which was built at the site of a parking lot. This will be the third Qdoba location in Essex County. Other locations operate at The Mall at Short Hills in Millburn Township and at Newark Liberty International Airport in the South Ward of the city. Qdoba is owned by West Coast fast food chain Jack in the Box. Another Mexican restaurant chain, Chipotle, opened a location on Market Street in Downtown Newark last year. The Qdoba location is currently hiring. Update: The location is slated to open on April 29. Newark, New Jersey: The Newark Downtown District will hold an event next week to celebrate the holiday season. The Downtown Holiday Celebration will be held on Friday, December 4th, from 5:00pm to 8:00pm at Championship Plaza. There will be musical performances, activities, a bounce home, a tree lighting, free family photos, giveaways, and other events. Admission to the event is free. Championship Plaza is located outside of the Prudential Center at the corner of Market and Mulberry Streets. Transportation is available using most area NJ Transit buses. Click here to learn more. Short Hills, New Jersey: A new pizza shop will open to customers in Short Hills. La Stazione Italian Restaurant will be located opposite the Short Hills Train Station at 38 Chatham Road, between Baltusrol Way and Woodland Road, near E.V.O. Delicacies. La Stazione is Italian for 'the station'. The space was previously occupied by the Chix-n-Pies chicken and pizza restaurant and Short Hills Pizza. It will be the sixth pizza place in Millburn Township, which includes Short Hills. 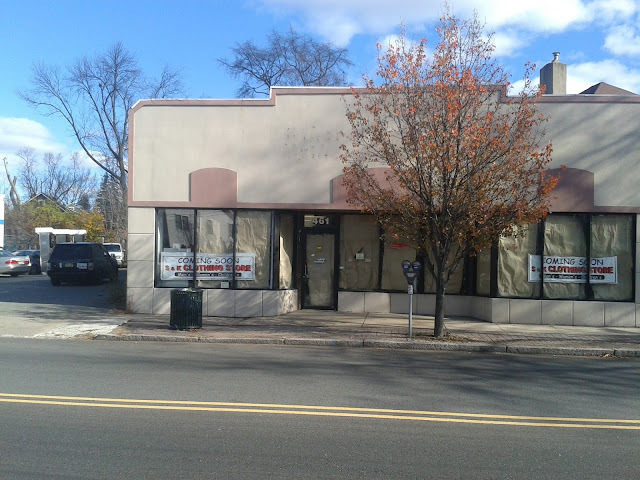 South Orange, New Jersey: Two new businesses will open in South Orange. Cafe Word will be located in the South Orange Village Center at 108 West South Orange Avenue, next to Jinny's Nails. The business will be a spiritual bookstore. The space was previously occupied by Kimaya Kama, a women's clothing store that moved to Maplewood, and The Little Candleshop. South Orange used to have a spiritual bookstore on Irvington Avenue called Prints of Peace, which is now a barber shop. A new business will also open in South Orange's Seton Village business district near the Newark and Maplewood borders. S&K Clothing Store will be located next to Delta at 461 Irvington Avenue, in the space previously occupied by Other Mothers Consignment. It will sell men's, women's, and children's clothing. Orange, New Jersey: Mayor Dwayne D. Warren, the City of Orange Township, and the Orange Fire Department will host a free community meal for less fortunate area residents. The lunch, an annual tradition, will be held on Thanksgiving Day, Thursday, November 26th, from 11:00am to 2:00pm at the Orange Fire Department headquarters. Admission is free. Volunteers are needed, and those interested can call the department at (973) 266-4230. The OFD headquarters building is located at 419 Central Avenue, at the corner of Lincoln Avenue. Click here to learn more. This photo shows a view of the abandoned Essex County Hospital Center in Cedar Grove from the Montclair Hawk Watch. Bloomfield, New Jersey: Essex County's newest supermarket is preparing for opening day. According to owner Jack Shakoor, Jack's Super Foodtown is scheduled to open in Bloomfield on November 30. The store will be located within the new Glenwood Village mixed use residential and commercial development in Bloomfield Center at 296 Glenwood Avenue, between Lackawanna Place and Washington Street. It will include hot food and sushi departments, a deli, a bakery, and a produce department. "We set out to put a city type store...and I totally believe we accomplished that", Shakoor told Essex County Place. The Glenwood Village development also includes a parking garage, bank, and restaurants. The area where the development was built was previously occupied by a row of buildings containing a convenience store, salon, and furniture store. Stop & Shop, ShopRite, and A&P also operate supermarkets in the township, though the A&P on Belleville Avenue will soon close. Aldi will also open a market on Bloomfield Avenue in the next few years. This marks a return of Foodtown to Bloomfield, where there used to be a location at 331 Broad Street, where CVS/pharmacy operates now. Jack's operates additional Foodtown locations in Caldwell, North Arlington, Bergen County, and Wayne, Passaic County. There is another Essex County Foodtown in Cedar Grove, though it is owned by a different company. Millburn, New Jersey: Downtown Millburn's 32nd Annual Snowflake Parade will be held on Sunday, December 6th, beginning at 1:30pm. The parade, which will be sponsored by the Downtown Millburn Development Alliance, will take place along Millburn Avenue, going from Spring Street near the American Red Cross branch to Holmes Street near Chase Bank. There will be bands, clowns, and costumed characters, and there will be activities for children following the parade in the Courtyard near Charlie Brown's Fresh Grill. In case of rain or snow, the event will be held on the following Sunday. Click here to learn more, or call (973) 379-2341. Livingston, New Jersey: The Livingston Public Library will host a program next month about author James Michener. Dr. Elliot Engel of the Dickens Fellowship of North Carolina will discuss how Michener's background and childhood shaped his novels on Monday, December 7th at 7:30pm. Michener's books include Tales of the South Pacific and The Source. The event is free and open to the public, and will be sponsored by the Friends of the Livingston Public Library through the Literary Liasons program. The Livingston Public Library is located at the Livingston Oval off of South Livingston Avenue. Click here to learn more. This photo shows the view of Downtown Boonton in Morris County from Bloomfield Avenue in Caldwell. This photo shows the former Marylawn of the Oranges school in South Orange, which may be acquired by the Orange Education Foundation. This photo shows South Orange's Mountain Station. South Orange, New Jersey: A film festival will be held in Downtown South Orange this winter. The South Orange Performing Arts Center (SOPAC) will host the SOMA (South Orange/Maplewood) Film Festival from Friday, February 12th to Sunday, February 14th in 2016. The deadline for film submissions is December 15th. According to the event sponsor, there will be film screenings, guest speakers, and networking opportunities. This is one of several recent arts events that have been held in South Orange. The South by South Orange festival in June was held at several locations across the village. The South Orange Performing Arts Center is located off of West South Orange Avenue at 1 SOPAC Way, next to the main South Orange Train Station. Click here to learn more. Newark, New Jersey: Newark's newest residential development is now open. 24 Jones, named for its address on Jones Street between Springfield and South Orange Avenues in the Central Ward, is located within the new Springfield Avenue Marketplace development. Rentals range in cost from $1,490 to $2,350. The building includes a parking deck and a fitness center. A ShopRite supermarket, the largest market in the city, opened next to 24 Jones in September. The Springfield Avenue Marketplace will also contain locations of Popeyes Louisiana Kitchen, Sarku Japan, and McDonald's. The site was a vacant lot for decades until construction on the development began in 2011. Click here to learn more. This photo shows the view of Newark Liberty International Airport, Port Newark, and the Ironbound as seen from Downtown. Newark, New Jersey: The People's Organization for Progress in Newark has announced that a protest will be held in 2016 on Dr. Martin Luther King, Jr.'s birthday, Friday, January 15th. According to the organization, the Dr. Martin Luther King, Jr. March For Racial Equality, Economic Justice And Peace will begin at 12:00pm at the Lincoln Statue outside of the Essex County Courthouse. The event will be part of an international day of protest. The Lincoln Statue is located in Downtown Newark at the corner of Springfield Avenue and West Market Street, Click here to learn more. Newark, New Jersey: The Original Pita Grill will open a location in Downtown Newark. According to posted signs, the new restaurant will be located within the Teachers Village development on Halsey Street, between William Street and Maiden Lane. The restaurant serves Mediterranean cuisine. Currently, all of The Original Pita Grill's five locations are in Manhattan, though the company owned restaurants in Morristown, Morris County and Hoboken, Hudson County until recently. Those locations are now part of the Pure Pita franchise. Krauszer's Food Stores will also be opening a location in the development. Click here to learn more. This photo shows the view of Newark's Central and West Wards and the First Watchung Mountain in West Orange as seen from the Newark Skylab. Newark, New Jersey: A long abandoned building in Newark's South Ward will soon be revitalized. The former Clinton Trust Company, located at 505 Clinton Avenue at the northwest corner of Chadwick Avenue, will soon become an arts facility named for musician Nina Simone. According to the Newark Department of Economic & Housing Development, there will be 27 affordable-housing apartments, a cafe, workspaces, an art gallery, and a performing arts space. A groundbreaking ceremony was held on Monday. The building has been abandoned for several decades, though the Clinton Trust Company inscription on the Chadwick and Clinton Avenue facades is still visible. According to the project proposal, the Clinton Avenue facade will remain, as will the century-old eagle sculpture atop the building. However, the remainder of the building will be torn down. The new arts center is one of several changes that have been made to this section of Clinton Hill. In the past five years, the Genesis Clinton Hill Apartments, Coffee Express, Mayor Ras Baraka's Little City Hall, and the Donald M. Payne, Sr. Public Safety Complex have opened on Clinton Avenue. The area near the Clinton Avenue corridor once had a large Jewish community, and the former Temple B'nai Abraham still towers over the street, though it is now a bible study center. Glen Ridge, New Jersey: The Creative Women's Collective's 2015 Artisan Gift Market will be held on Saturday, December 5th, from 10:00am to 4:00pm. The twelfth annual event will take place at the Glen Ridge Congregational Church. Admission is free, and thirty local artists, artisans, and crafters will participate, selling items like jewelry, pottery, and clothing. The Glen Ridge Congregational Church is located at 195 Ridgewood Avenue, between Clark and Lincoln Streets. Click here to learn more. This photo was taken near Military Park in Downtown Newark. West Orange, New Jersey: A regional credit union will open a location within the Essex Green Shopping Center in West Orange. Atlantic Federal Credit Union will open at 455 Prospect Avenue near TGI Fridays. The space was previously occupied by TD Bank and TD Banknorth. Atlantic Federal Credit Union, which is non-profit, has additional locations in Downtown Newark, and in the Union County municipalities of Elizabeth and Kenilworth. Membership is limited to those who live, work, worship, attend school, or conduct business and Essex or Union Counties, according to the credit union. Livingston, New Jersey: The Livingston Public Library will hold a program regarding President Harry S. Truman this Wednesday, November 18th, beginning at 7:30pm. Professor David Foglesong of the Rutgers University History Department will explain Truman's presidency and role in the Cold War. The lecture is free and open to the public. The event, which will be sponsored by the Livingston Public Library Endowment Fund, is the final part of the Louis W. Venza Memorial Lecture Series. Previous programs discussed the Korean War and General Douglas MacArthur. The Livingston Public Library is located at 10 Robert Harp Drive, off of South Livingston Avenue. Free parking is available, and the NJ Transit 73 Bus stops outside. Click here to learn more. This photo shows the Newark Broad Street Train Station. Verona, New Jersey: A new park will open to visitors and community members in Verona this week. Township of Verona's Grove Park Historic and Nature Preserve will open on Saturday, November 21st. The ribbon will be cut by the mayor, members of the Verona Township Council and Environmental Commission, and the Verona Historical Society during a public ceremony at 10:00am. The Junior Woman's Club of Verona contributed funds to the project. The park features benches, trails, and historic plaques. Dr. Henry B. Whitehorne, the founder of Glen Ridge's Mountainside Hospital, once lived at the site. Grove Park is located at 42 Grove Avenue/Route 639. Click here to learn more, or send an email to veronaenvironmental@gmail.com.